Long summer days on end holidaying at the beach is not something I can say we grew up doing except on occasional weekends, however my husband and his extended family did. Every Christmas and Easter holidays were spent at the seaside at Cowes, Phillip Island since a very young age. San Remo is the last southern coast mainland town before the bridge takes holiday makers to the island. The islands towns, Newhaven and Ryll hold much fishing history and are also lovely to visit during the colder months. So knowing that July’s Cucina Conversations topic was going to be seafood, I timed our short getaway last month to East Gippsland with a day trip to Phillip Island to the fishing village of Newhaven. I looked forward to buying some fresh calamari and cooking this dish (which I hadn't made for years) in the quaint fully equipped kitchen at Marges Cottage. On our early morning drive up, I heard many stories of my father in law spending hours out near the pier using a bucket he had cut the bottom out of and replaced with glass so he could look through to spot and retrieve abalone. In Italian they are known as orecchie di mare, and buckets were filled (which is totally prohibited now) to then be brought back for the family to prepare and enjoy as thin crumbed cutlets pan fried. Crumbed and fried sardines were another specialty enjoyed by this Sicilian family. We on the other hand ate fish only on Fridays and mamma would cook the type papa` generally preferred to eat such as garfish lightly floured and fried or salted cod two ways - baccala` con peperoni cruschi (fried with crispy peppers) or baccala con le patate e olive (with tomatoes, potatoes & olives). Occasionally she would make stuffed calamari as a treat which I absolutely love. This dish of calamari ripieni is cooked in a simple tomato sauce and only requires a few staple ingredients. In search of calamari and missing the early morning rush to the fish monger at Bass Strait Direct, I had to content myself with squid instead. This soon became my lesson on the difference between arrow squid and southern calamari. There is definitely a difference in price, with calamari being far more expensive but assured that there wasn’t much difference in flavour or texture of the fish as the squid on offer was small in size. You can identify squid from calamari by the fins that form an arrow shape on the end of the squid's hood. The fins of calamari extend almost all the way down the hood. The fishmonger informed me that the squid is just as tasty and tender if cooked correctly and calamari are just overrated and therefore more pricey. It was suggested I prepare the squid by chopping up their fins and tentacles and stuffing these back into the hood with fresh breadcrumbs and slowly cooked in a tomato and garlic sauce and the slow cooking tenderises the squid's flesh. Exactly what I wanted to hear as this is how I’ve known them to be cooked by mamma and the way I’ve enjoyed them most. For this dish, do avoid buying the calamari tubes, which are large and inferior in quality and aim to buy fresh squid or whole calamari which your fish monger can clean for you if you are reluctant to do so yourself. I have to admit that I did take advantage of this service remembering I was on holidays after all. This dish can be cooked and served as a main, or the Italian way – by doubling the amount of chopped tomatoes and serving the sauce on some pasta as a primo (starter) and then the squid with a serving of salad as a secondo (main). I didn’t follow any particular recipe, but remembered how mamma would cook them and used the basic ingredients I had on hand. 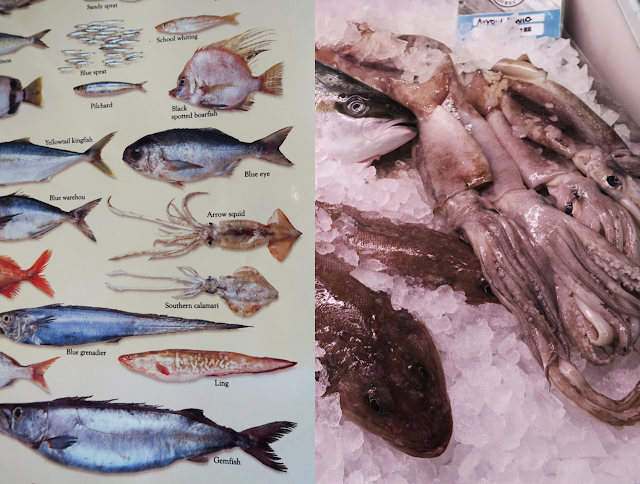 If you ask your fishmonger to clean the squid or calamari, then the rest of the process is a breeze. Cleaning them however isn’t at all difficult and this youtube clip shows you how.Once cleaned and rinsed, chop the wings and half of the tentacles for the stuffing and set aside. I kept the other half of the tentacles whole as I like the look of them on the plate. Heat 3 tablespoons of the olive oil in a pan over a medium heat, add the chopped onion and cook until translucent but not browned. Add the chopped squid and garlic. Turn the heat down and cook for 15 – 20 minutes, stirring constantly. Turn off the heat and stir in the breadcrumbs. Set aside to cool down completely. Once cooled, add the egg, parmesan cheese, parsley, salt and pepper to taste. Mix well. Use a spoon to stuff the hood of the squid with the mixture, about three-quarters full. Do not over fill as the body will shrink when cooked. Securely close the opening of the squid with a toothpick. I only filled four of them as two of the hoods were punctured when cleaned and I didn't want to risk them bursting into the sauce. In a large pan, heat the remainder of the oil, and in a single layer brown the squid on all sides. Turn the heat to medium and add the white wine and cook for 3 minutes, turning the squid several times. Add the tomatoes and season to taste. Turn the heat on low, cover with a lid and cook for 40 - 50 minutes, depending on the size of the squid. I cooked mine for 40 minutes. Turn them occasionally during the cooking and if the sauce dries out, add a little hot water. The squid are cooked when they feel tender if pricked by a fork. Sprinkle with chopped parsley before serving. I like to slice them and spoon a little of the sauce over each one. If you increase the quantity of tomato, it makes a lovely sauce over some spaghetti or linguini pasta. This dish was enjoyed with the perfect country sunset and a few glasses of rose. Thank you Cheryl for the use of your lovely kitchen and the bottle of wine. Lisa from Italian Kiwi has also cooked with calamari and made calamari fritti. I didn't know the difference between calamari and squid either. That's a really interesting tip! The stuffed squid look delectable! I never really gave it too much thought until I found myself having to purchase squid when I was actually in search of calamari. They were so tender and flavorsome.